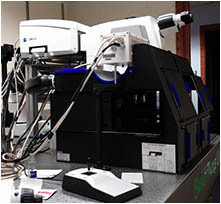 Inverted laser scanning confocal microscope This confocal is on an inverted fully motorized Zeiss Axio Observer Z1 microscope. 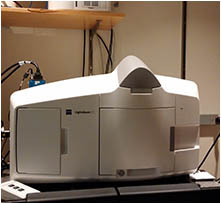 With the 3 GaAsP detectors and its short light path this is one of the most sensitive microscopes in the BIF. While GaAsP detectors are more sensitive than the Photo Multiplier Tubes (PMTs) typically used in confocal microscopes, that is not the case in the far red where standard PMTs may actually be more sensitive. 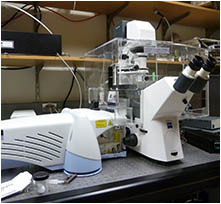 The Definite focus (via the Z-Control of the Axio Observer) corrects for thermally caused focus drifts as well as Z-Offsets introduced when moving to new sample positions The 405 laser line allows for photoconversion of photoconvertible proteins such as Kaede and Dendra. 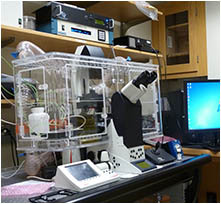 The incubation chamber, besides being able to control temperature and CO2, can also regulate O2 levels, perfect for mammalian cells or embryos that require low oxygen. The tiling function in the Zen Blue software is quite powerful and allows one to collect multiple images across a large field of view using a high magnification objective. 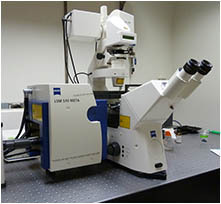 This microscope also has a color CCD camera (Zeiss Axiocam) for collecting regular wide field images. 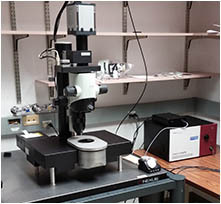 While this microscope can collect spectral data sets, it does so across a narrower range of wavelengths and more slowly than our other spectral capable microscopes (use the LSM 710 or 880 instead). 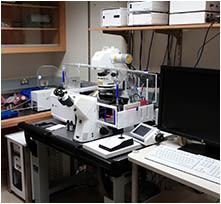 This microscope was installed in January of 2016. Location: Beckman Institute Basement Room B133H. 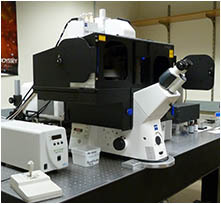 • This inverted microscope has a scan head with 3 GaAsP detectors and 1 detector for transmitted light. • Four Diode Lasers. All solid state lasers. 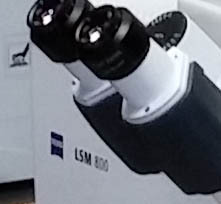 • Zeiss Definite focus to eliminate Z drift.